I have been playing around with more options for my holes. This time I tried things I didn't even think would work, just for the fun of it. 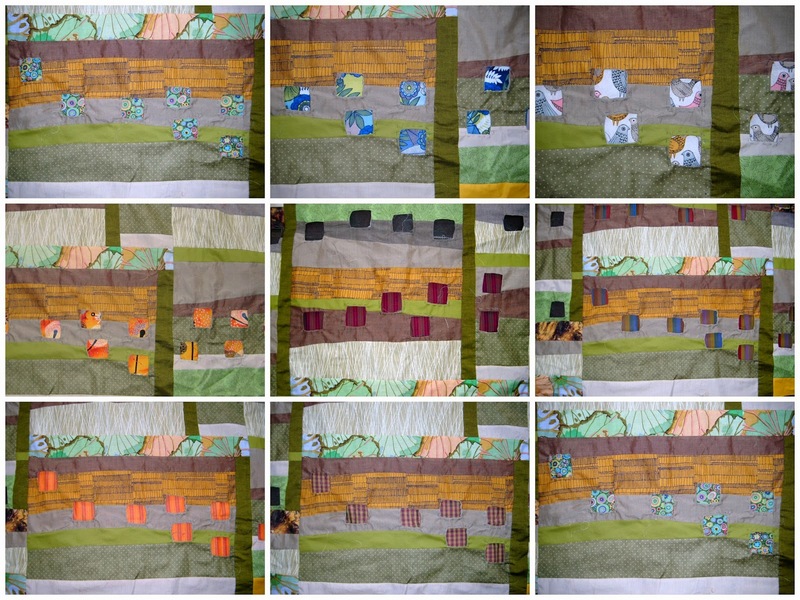 Linking up with Patchwork Times for Design Wall Monday. I like the first one, with the yellow/orange fabric, because it makes me curious about what's going on behind the holes, the diversity in each one. Whereas the second one, while the stripe is very eye catching at first, seems more like a curtain drawn than the first one, which seems more engaging. The yellow orange one give the work a real zing. But go with your gut feeling - it is usually best. I like the orange one. It feels like it belongs with the top, but it stands out as different at the same time. Somehow it just intrigues me more....I want to open the holes and look inside. Of course, this is looking at it through a photo, in person, who knows what would strike my fancy? So, of course, do what is right for you. I have no doubt whatever you decide, it's going to wow all of us!